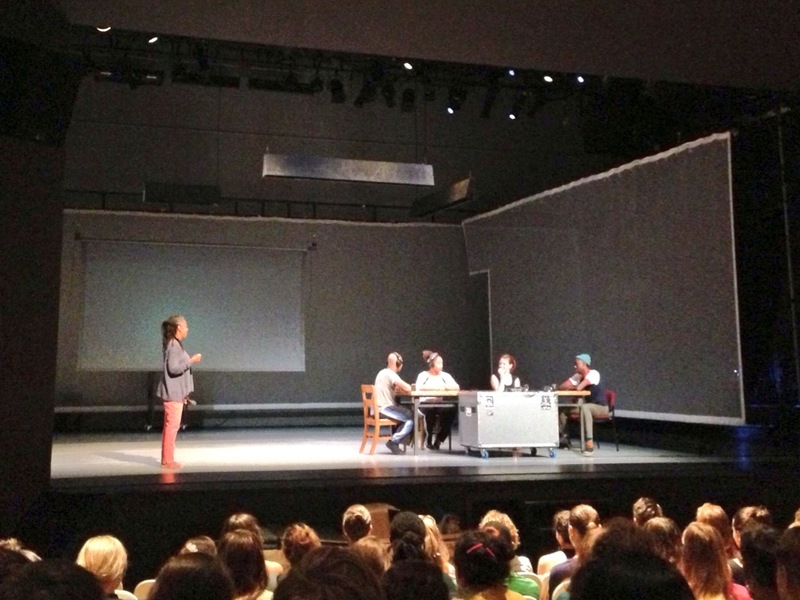 Last night Bebe Miller Company took to the stage for a Show & Tell centered on their newest work, A HISTORY. Bates Dance Festival has its own long history with this company going back to when Laura Faure brought the company in the first year she took over as director in 1988. Since then, Bebe Miller has brought every major work she has created over the past 25 years to the festival. This informal evening brought dancers Angie Hauser and Darrell Jones along with Ms. Miller herself, to the stage to show an excerpt, along with a few videos and a discussion about the creation of the work. The work itself is a duet between Angie and Darrell that focuses on their 20 year history of dancing together. It holds a detailed improvisational score along with video work featuring all of the collaborators. Bebe Miller brings two audience members up on stage to help demonstrate a section of the work. A very cerebral look into the creation of dance, both this piece and the Show & Tell give us a look into what it might look like, sound like or feel like to be in the studio with these creators. Because the work is improvised, the audience had a lot of questions both about the structure and thoughts of the dancers. Bebe explained that because the way the company is structured now, with collaborators living all over the country, they decided that what they most wanted to focus on was a state that had been generated rather than remembering specific steps. I enjoyed hearing Angie Hauser describe what it is like to be “choreographing in real time.” She explained that the biggest challenge is trying to recreate a feeling or cognitive state she has in the studio where time is of no importance. Translating this to the stage becomes much harder when there are certain landmarks to hit or a time frame to stay within. But the joy of improvising comes from those little tiny moments of surprises or surprising the person you are working with. I am even more excited to see how this all plays our on stage. I feel like we got a great taste for the relationship between all these collaborators and the ideas they are wrestling with. You can purchase tickets to this weekend’s show on the BDF website.